The AbraxSys new high performance, anti-reflective, protective impact window boasts a virtually invisible anti-reflective coating delivering the finest imagery in crystal clear color neutrality, while its UV-filtering, abrasion resistant acrylic, and anti-static coating result in uncompromising protection and preservation. AbraxSys debuts another model line of 19″ ruggedized LCD monitors. These 19″ models take care of a rising demand for higher quality, hardened display units than ordinarily accessible through other industry providers. This recently launched series offers such attributes as SXGA 1280 x 1024 resolution, 450 nits, broadened operational temperature ranges, high end TFT boards, a vast array of inputs including VGA, DVI, S-Video. DisplayPort, HDMI, and Composite, and available for any conceivable mechanical setup required for industrial, signage, point of sale or outdoor monitors. The DisplayPort video interface delivers higher performance imaging than any other digital video interface. Developed to replace outdated, less versatile standards like DVI and VGA. Opening up new capabilities in display imaging, digital displays and consumer electronics, DisplayPort is the coming standard and it’s available on the majority of AbraxSys industrial and high bright LCD models. AbraxSys new line of 17″ and 24″ rugged industrial and sunlight readable LCDs are designed meet the specialized demands needed to provide display brilliance in the harsh conditions of vehicles or outdoor applications. AbraxSys announced today the release of a new harsh-duty 12.1” sunlight readable monitor series with IPS industrial panel and Projected Capacitive Touch Screen. This new sunlight readable series of 12.1” high bright, touch screen LCD monitors perform ideally in high ambient light conditions, delivering the intensity, brilliance and long product life cycle required by outdoor applications. AbraxSys enhanced high bright TFT active matrix displays deliver a maximum brightness level of 1100 nits (cd/m2). AbraxSys’ direct sun, daytime readable LCDs significantly outperform cheaper non-enhanced commercially available products that washout in direct sunlight conditions. IPS (In-plane switching) is a screen technology for liquid crystal displays (LCDs). It was designed to solve the main limitations of the twisted nematic field effect (TN). These limitations included strong viewing angle dependence and low-quality color reproduction. PCAP (projected capacitive touch) technology is an ideal choice for a wide range of industrial-grade applications, such as process control terminals, medical displays and agricultural vehicle telemetry systems, as the touch performance in unaffected by scratches, dirt and dust on the screen. They can also be operated by a user wearing heavy gloves, and can be sealed to extremely high IP rated systems making them suitable for challenging or outdoor deployments. AbraxSys Upgrades its Sunlight Readable 15”, 17”, and 19” Products with Extremely Wide Operational Temperature Range Capabilities and Brighter, Clearer Images. The AbraxSys 15”, 17” and 19” sunlight readable SRD displays have been newly modified with ultra wide extended clearing temperature range panels, high nit levels and wide contrast ratios. These new advancements will better meet the operating temperature, image quality and luminance requirements of AbraxSys industrial customers. Special heat management ensures displays have industrial-environment-compatibility to achieve tolerance for the operating temperatures required in many industrial applications, AbraxSys uses very wide clearing temperature true industrial grade LCD TFT panels and as well has designed the housing of the new LCDs specifically for LED background lighting and equipped them with dedicated heat management: heat conductors transport the waste heat of the LEDs and their drivers to the rear outer side of the panel where it can be easily given off into the environment. The new LED backlight versions of the proven industrial-grade LCDs therefore fulfill industry specifications with an extended operating temperature range of -30°C to 75°C and a service life of up to 100,000 hours. Extreme temperatures can cause a number for problems for LCD displays. 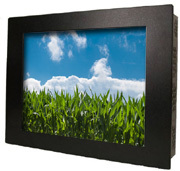 An inexpensive computer monitor, the kind you buy at your local big box store or from a commodity supplier in Asia, may have an operating temperature range of 0° C to 32 or 40° C. That’s fine for most office uses but is inadequate for many harsh environment applications such as outdoors in direct sun. Many real world applications have special demands when it comes to thermal capabilities, such as -30°C to 75°C. Industrial, non-automotive transportation and military sectors, among others, often require LCD displays that can operate in such extreme temperature environments. The LED backlit displays from AbraxSys are an advanced engineered combination of the high stability required for industrial applications and the benefits of an LED backlight. These include, among others, the prompt response and long-life characteristics of the LEDs particularly at low temperatures and excellent dimming capability over the entire brightness range of the LEDs. Another important advantage of the LED backlight is the low-volt operating voltage. This means that the high-voltage inverter required for CCFL lamps is no longer necessary. Amongst other things, the high image quality of these newly designed display are due to the extremely uniform illumination of the display by the very bright LED backlights. Overview of the various industries who utilize touch screen technology and why touch screens are increasing in demand. AbraxSys releases the MRM-170, a new 17” rugged LCD NEMA 4 (IP65) rated display for use in extreme vibration and/or harsh weather conditions found in many land-based, airborne and shipboard military applications. The MRM-170 is designed with shock and vibration safeguards in mind and includes provisions for extreme temperature operation, high moisture protection, and Electromagnetic Environmental Interference safety. This ultra-rugged unit can be fitted with an LED Filter Backlight for NVIS Operation. The MRM-170 has a Solid State LED Backlight and Full-Range Dimming to black. 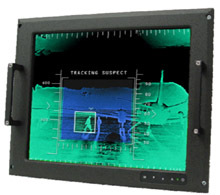 Target application platforms for the MRM-170 rugged COTS LCD monitors include: fixed-wing aircraft, helicopters, surface ships, submarines, ground vehicles (not just military), mobile shelters and even harsh duty industrial environments. AbraxSys’ MRM-170 COTS Military grade LCD monitor features an 800 nits (cd/m2) very bright LED-backlit LCD with a 1000:1 contrast ratio. 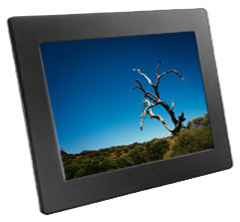 The LCD support SXGA native resolution 1280 x 1024 and 16.2 million colors for a vibrant display. The system also offers Cold Start-Up @ -25°C 3min. usable picture and 20 minutes to full specification. Available options include NVIS, touch screen, strengthened frontal glass, varying video inputs and even unique video signal support through an advanced signal recognition controller. Additionally, the MRM-170 is a suitable replacement for the Barco MRFD-243.